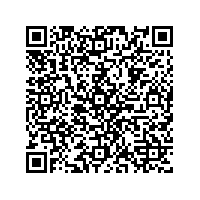 Scan this QR-Code with your mobile to add Babycakes NYC to your address book! Ohhhh how I love Babycakes. Super hip, super tiny and super tasty, Babycakes has some of the best vegan cupcakes, cakes, loaves, cookies, scones, macaroons and muffins I've ever had the joy of eating. And before you die you must try their cinnamon buns! The waitresses are all decked out, with their signature mixture of punk and 50's diner fashion. 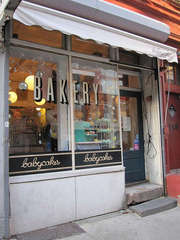 Only thing that would make Babycakes better would be if they had a larger seating area to sit and enjoy your vegan baked goods and the mixture of customers coming in and out. cute tiny bakery filled with vegan, sugar free and most of all delicious baked goods. it is hard to leave with just one cupcake and in only 5 days in the city I managed to swing by three times and was never disappointed with my choices. I loved the skinny buns, cookie sandwiches and the red velvet cupcake but wasn't too impressed with the brownie bites. service was friendly, the coffee was too watery but overall I adore babycakes for its great interior, cute staff and great vegan baked goods that cater to all that cannot or do not want to eat certain ingredients. this is my favorite bakery in new york! the pastries are a little bit overpriced but definitely worth to spend a little bit more. they use no refined sugar but mostly agave nectar to sweeten. most of their goods are soy free and SO EXTREMLY DELICIOUS!!! the shop itself is adorable cute. there are not that much seats, but if you grab one you definitley will want to stay there for a long time. I love this place, vegan cupcakes are my fav.